I really struggled to come up with an idea for October's self-portrait. It wasn't so much that this month was boring, but nothing specific stood out that represented the month. October started out with my parents here, and us visiting Kevin's family back in Indiana. We went out with friends while we were there, and also here in Phoenix. I shot and edited a few photo sessions. I worked, Kevin went to school, we watched a few movies, and hung out at home. In a word, this month felt normal. Blissfully, happily, normal. Normal is something that I haven't felt in a very, very long time. Things have been in one form of turmoil or another for so long that I couldn't really remember what normal was, or what it felt like, but October once again brought a glimpse of it back into my life. I would have loved to come up with some sort of creative idea to photograph normal, but no matter how hard I tried I drew a complete blank. So, instead I opted to focus on the result of this normal feeling returning to my life. I finally had time to stop and ask myself, "Am I happy? Am I living the life I want to be living? Why or why not? How can I change that?" I realized that I've fallen victim to spending way too much time on the internet. I've turned into an email, facebook, twitter, instagram junkie. There are even times when I will be sitting in front of my computer with facebook open in front of me, and pick up my phone, only to open the facebook app on it, too. 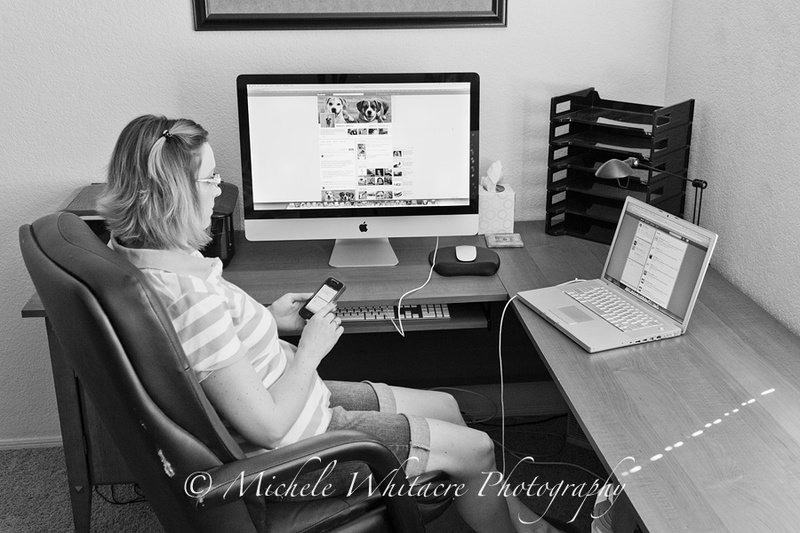 When I catch myself doing this, I shake my head with wonder as to how I got so addicted to social media and what could possibly be so exciting that I need to be checking it simultaneously on two devices. I'm not quite sure what my obsession is with black and white self-portraits, but as I was looking back recently I noticed that I seem to lean towards b&w more often than not. I'm going to make a conscious effort to start adding more color into my self-portraits in the coming months! I've also been surprised to note how many of these images I take using the stock lens that I got when I purchased my camera because it is the widest angle lens that I own. I never use it during my portrait sessions. In fact, I don't even keep it in my camera bag. I think I'm going to toss it in and challenge myself to use it for some shots during an up coming session, just to see what I can create with it.